[Offprint.] The Wilde Lecture. V. The Mechanical Principles of Flight. By the Rt. Hon. Lord Rayleigh, F.R.S. Delivered February 13th, 1900. 26pp., 12mo. Stitched. In remains of original printed wraps. On aged paper, in chipped wraps, with several leaves loose. An important work in the history of eronautics by one of the great experimental physicists of the nineteenth century. Excessively scarce: no copy of this offprint in the British Library or on COPAC. 'In this lecture Rayleigh discusses the method of calculating the mechanical forces on a plane presented obliquely to a current of air, so far as this can be done. At best, the calculation is very incomplete. Berlin, 1912 [Bibliothek fur Luftschiffahrt und Flugtechnik, band 8]. pp, 8vo, including three pages of advertisements, corners bumped, hinge strain front endpaper, mainly good condition. Ex lib Royal Aeronautical Society (bookplate inside cover) with library shelf marks on half-title and elsewhere. Inscribed by the Author as follows, With the best thanks and compliments | of the author | Gustav von Falkenberg || (see p.5, 6, and 92). These page references indicate that the deicatee is T. O'Brian Hubbartd who features on these pages. 12mo, 133 pp. 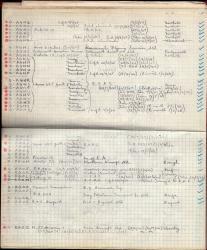 Hundreds of neat entries, in a small hand, written lengthwise on graph-paper pages in a red-cloth 'Memoranda' book ('Compliments of Ingersoll-Rand Co., Limited, 165, Queen Victoria St., London, E.C.4.'). 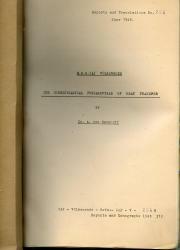 Good: with text clear and complete on lightly-aged paper, in the original worn red binding. 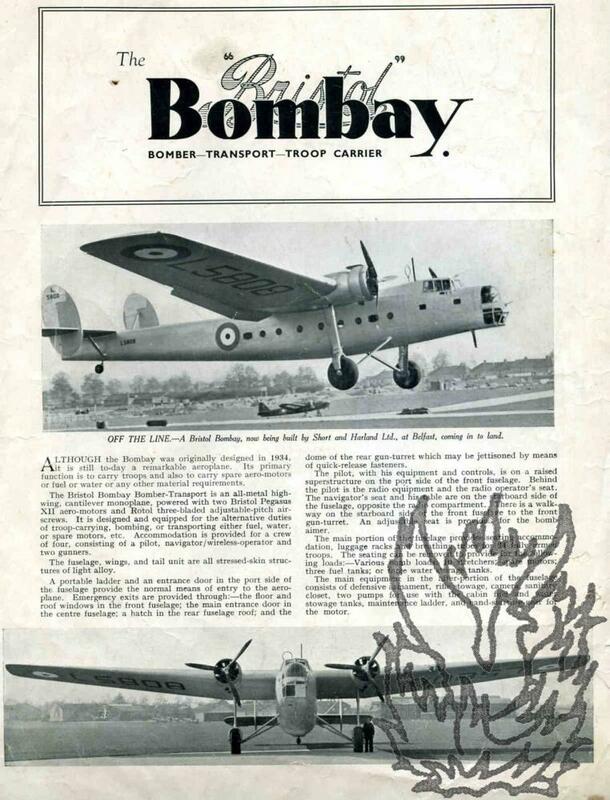 Many entries are dated (with a few also giving the dates on which various planes crashed), and among the airports referred to are Northolt, Yeovil, Radlett, Cowes, Rochester, Guernsey, Jersey, Peterborough, White Waltham, Hanworth Park, Elstree, Cranfield, Luton. Seven pages, 8vo, sewn as issued, very good condition, with additional leaf inserted (one printed page), edges staine. The insertion is a Postscript on gun cotton. Two copies on COPAC. Reports and Translations No. 234. The Hydrodynamical Fundamentals of Heat Transfer. M.O.S. (A) [Ministry of Supply (Air)], Völkenrode: June 1946. Not published. Cyclostyled on the rectos only. 8vo: 165 pp followed by 28 pages of 'figures'. Contained in a buff 'Apex Vertical Filing Folder'. Very good, on aged paper. Complete and clear. 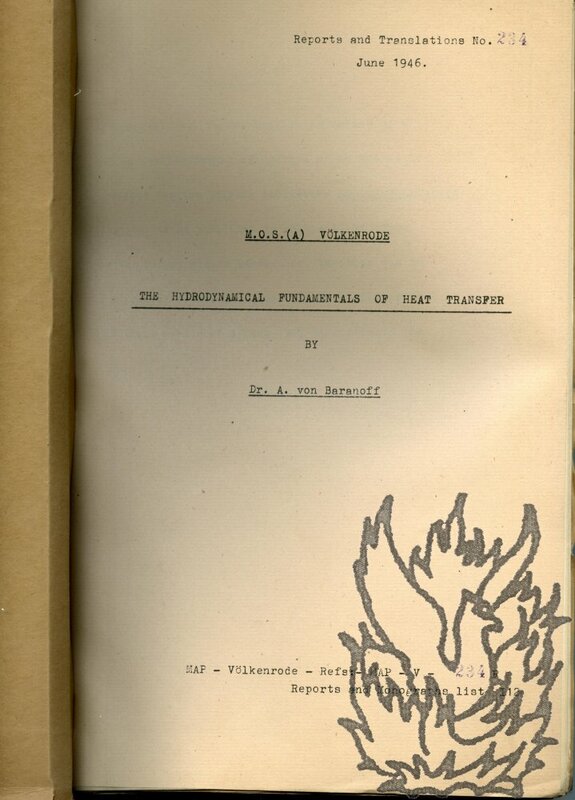 Stamped 'UNCLASSIFIED' on front cover, with manuscript reference 'GVC/54T'. Preface reads 'The present work is the English rendering of a partly revised German manuscript which the Author prepared for the Leipzig publishers Bibliographisches Institut to be published as volume 49 of their series Meyers kleine Handbücher. 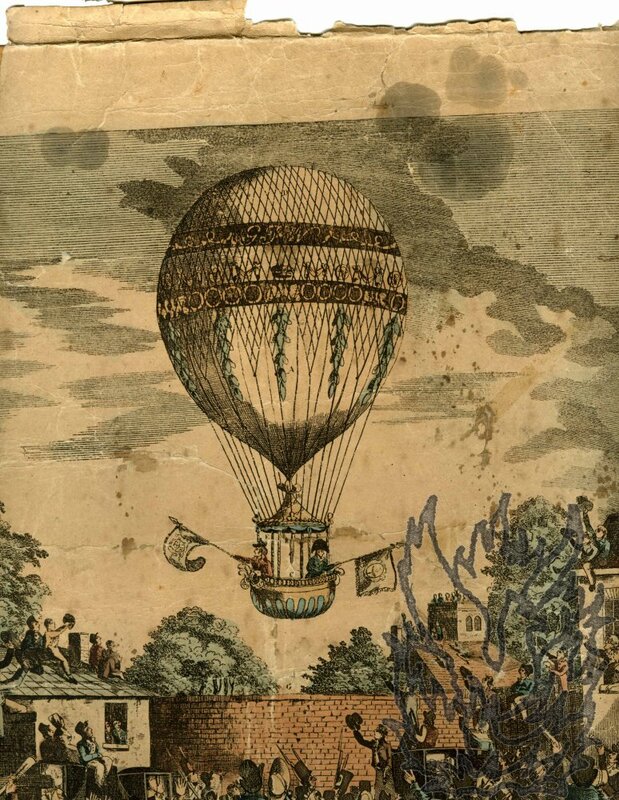 Original hand-coloured print, with key, showing 'A View of the Balloon of Mr. Sadler's ascending, With him and Captain Paget of the Royal Navy from the Gardens of the Mermaid Tavern at Hackney on Monday Aug 12 1811'. Originally on a piece of paper roughly 405 x 315 mm, with the dimensions of the print roughly 295 x 250 mm. In poor condition: torn and stained and laid down on a piece of thin card, and with the extremities of the margins chipped. Loss to top-left and bottom-right corners. The loss to the top corner includes a corner of the print (roughly 40 x 20 mm), but this only features the sky. 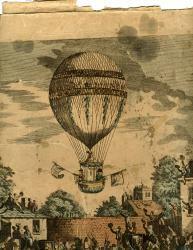 A scarce item, with the caption continuing 'The Balloon ascended at 3 O clock in the afternoon and descended safe near Tilbury Fort in Essex at 20 Minutes past four'. 12 Typed Letters Signed (all 'W Barnard Faraday') to Sir Henry Wood, Secretary, Royal Society of Arts, and his colleague G. K. Menzies. 3 February 1917 to 11 October 1918; all but two on letterheads of the Royal Aeronautical Society of Great Britain. One of the letters is 4to, 2 pp; ten are 4to, 1 p; and one is foolscap, 1 p. The collection is in good condition, on lightly aged paper. Many of the letters are docketed and most bear the Society's dated stamp. 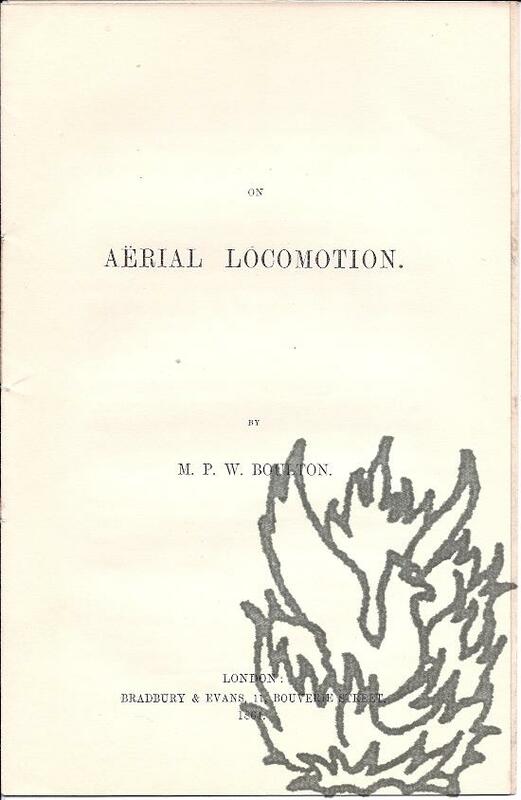 Written in the capacity of Secretary of the Aeronautical Society, and editor of its 'Official Organ - The Aeronautical Journal'. Topics include the hiring of the Royal Society's hall for two series of talks to the Aeronautical Society. Faraday also discusses the details of a lecture by 'Mr. Seven Autograph Letters Signed and one Typed Letter Signed (all eight items signed 'John M. Bacon') to Sir Henry Trueman Wood (1845-1929), Secretary, Royal Society of Arts. 16 September to 22 November 1901; on 'Coldash, Newbury' letterheads. Autograph items (all 12mo) very good; TLS (letter 7, quarto) aged and worn at extremities. All items bearing the Society's stamp, and most docketed as answered. Letter 1 (16 September 1901, three pages). Asks if Wood will 'act as Judge' at a 'Photographic Exhibition' held at 'a local Institution'. Letter 2 (23 September 1901, four pages). On behalf of Committee thanks Wood for agreeing. 'The Exhibition beings to take definite shape'. Suggests that 'one other Colleague to assist' may be needed, and suggests individuals. Letter 3 (27 September 1901, four pages). Stead's Wonders of Science Series. The Story of Flying Machines. The Conquest of the Air. With eleven specially selected illustrations. London: Stead's Publishing House, Bank Buildings, Kingsway, W.C.2. Printed by W. & J. Mackay & Co., Ltd., Chatham. Octavo, 48 pages. Stapled. In faded original orange printed wraps. Nine pages of illustrations, including three on wraps. Good, on aged high-acidity paper. Wraps a little stained. Unobtrusive ownership inscription at head of front wrap. 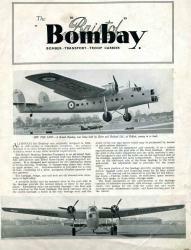 Illustrations include two full-page balloons and 'A modern sea-plane: the Burgess-Dunne type'. Twelfth illustration (diving English biplane) on front wrap. Scarce: no copy on Copac. Twenty-one Typed Letters Signed to the Secretary, Royal Society of Arts. Between 1931 and 1934; all on letterhead of the Royal Aeronautical Society, of which Pritchard was secretary. 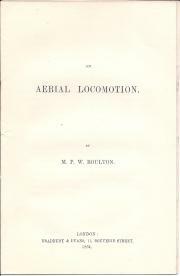 Novelist and writer on aeronautics (1885-1968). All items one page, quarto. As a whole good, though grubby, but some items with pin holes, closed tears, etc. Most bearing the R.S.A. stamp and some docketed. Three items with enclosures. 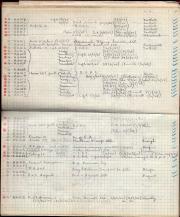 The items are dry communications relating to the arranging of R.A.S. lectures at the R.S.A. Three Autograph Letters Signed and one Typed Letter Signed to Kenneth Luckhurst, Secretary, and G. P. Griggs, Assistant Secretary, Royal Society of Arts, together with four unsigned carbons of Typed Letters from them to him. 1949-51; three on letterheads of the Victoria & Albert Museum. Historian of aviation (1909-81) at the Victoria & Albert Museum, London. Eight items, various formats. Very good. LETTER ONE (two pages, octavo, 14 January 1949, on V & A letterhead): 'As a very new fellow of the Society I hesitate to burden you with reading the enclosed [an article on 'Father Gusmao: the first practical pioneer in aeronautics', not present], but I thought there might be some chance of its appearing in the Journal. It is too historical for the Roy. Aeronautical Society's Journal and too aeronautical for the others, so I am stuck! The Sea Hornet: design, construction, and development. A large collection of material concerning the Hornet, 1944-1946, illuminating not only on the development of the Hornet but de Havilland procedures. It includes blueprints, drawings, data, memoranda, concessions, technical bulletins, service complaints, and related, as follows:1. (De Havilland Aircraft Co, company technical procedure) 25 large blueprints of various parts, folded. One has note "This Jack Assy to be used in Ist 15 Aircraft only", another "Sub-Contracted", etc.2. (De Havilland Propellers). Two large drawings, c.25 x 13", folded (Hydromatic Four-Bladed Type: a.
CATALOGUE OF THE WELL-KNOWN COLLECTION OF BALLOONING AND AERONAUTICAL PRINTS AND DRAWINGS The Property of Col. R. L. Preston, C.B.E. [sale of 20 March 1962]; London: Sotheby & Co. 34 and 25 New Bond Street, W.1. 8vo. 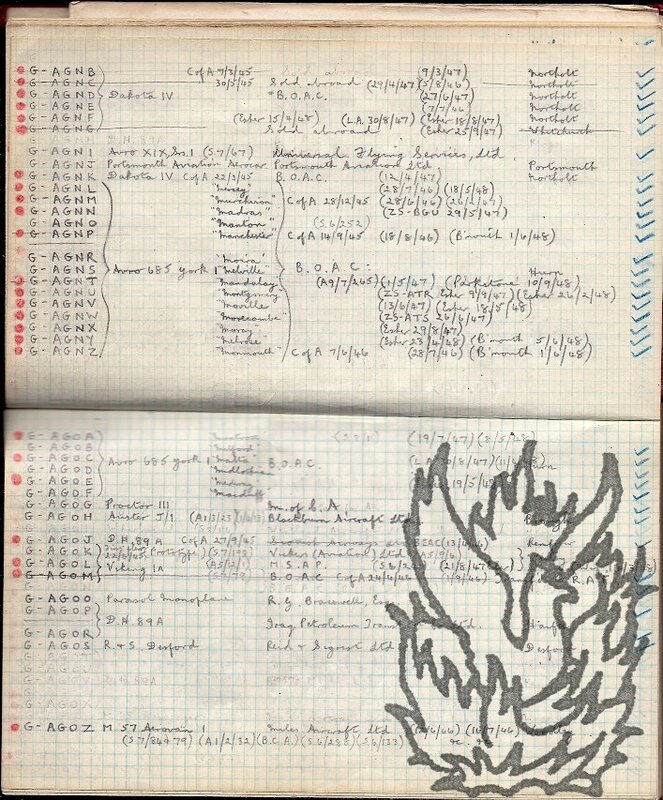 Pages [2 +] 120. In good condition. Printed green wraps with crease along length of front wrap. Many illustrations. 'INDEX OF AERONAUTS' on verso of last leaf. An invaluable scholarly resource.